When you first lay eyes on BMW’s new Z4, it shocks you just how aggressive it looks. The hood is massive, the headlights seem to have attitude to them, and the sweeping lines run sleekly down the sides. The car has aggressive looking wheels, those iconic kidney grills, and a hard top roof that disappears into the trunk. It has everything that makes for a fun little roadster: style, a drop top, and a short throw 6 speed manual transmission. 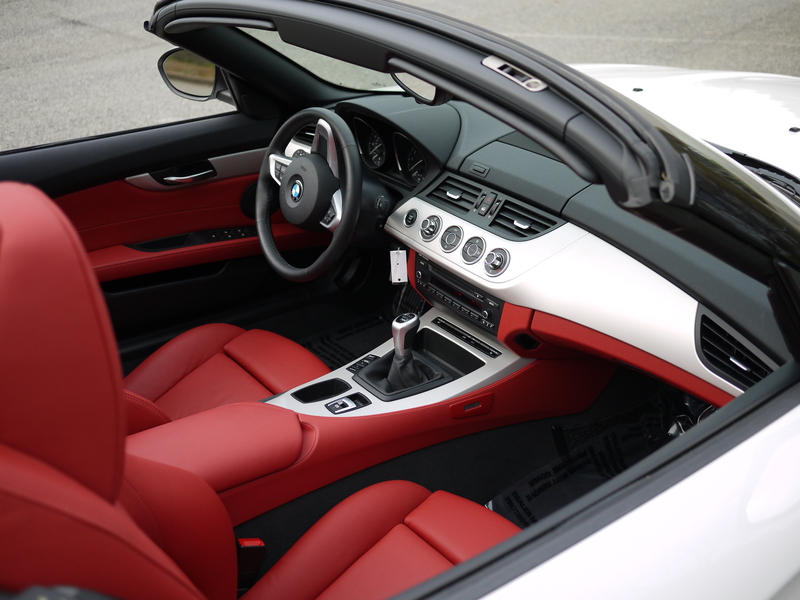 All the Z4’s feature a nicely laid out dash, but it certainly feels different than your normal 5 series or 3 series. The buttons for the AC are on top of the radio – almost at gauge cluster level. The radio is normal, however the cup holders are hidden inside the center console. Which just doesn’t make sense. Luckily for the Z4, the convertible top drops with ease and you barely have time to look behind you before you get going with the wind in your hair. The parking break is electric, which in a roadster is something you have to get used to, but isn’t all that bad of an idea. The one odd part about driving the Z4 is that when you are at a read light, and you are on a hill, and you take your foot OFF of the brake in order to get ON the gas, the car does NOT roll backwards. And if you have grown up driving a normal manual, that’s a very odd feeling: taking your foot off the brake, and staying exactly where you are. The interior is gorgeous, especially if you opt for Cinnamon or Imola red which accent the Alpine White exterior brilliantly. The seats offer plenty of support while also keeping you planted in the event you feel like driving a little bit spottily. This particular model features the 3.0 L straight 6 and has a delightfully throaty exhaust note. Step on the gas though, and you just keep waiting for something truly exciting to happen. The car looks mean and aggressive. it looks like it wants to hunt down little Infiniti G’s and Mercedes SLK’s and eat them for breakfast. Sadly, the SDrive3.0 doesn’t really do that… The car is tight and nimble around the corners and the transmission shifts beautifully smooth, but the kick you in the pants feel just isn’t there. Luckily, BMW also makes a different variant of the Z4: the SDrive35 (pictured in Blue) which features the same engine form the 335i. And that, is quite a power plant for a roadster barely larger than your bathtub. The engine hardly sounds boosted, but it drives just as well planted as you would expect from BMW’s roadster. Compare the Z4 to the 135i and the Z4 wins in almost every category, despite sharing the same motor. The 135i doesn’t feel as planted, nor as nimble as the Z4 does. The Z4 feels much more refined, much more stable, and successfully puts down all of that twin turbo power. Perhaps the best part about the SDrive35 is that when you downshift, the exhaust gurgles! The SDrive35 is an incredible car, and despite testing it with BMW’s double clutch gearbox rather than the 6-speed, the car was an absolute blast on the road. Its not an M car, just based on the feel you get from both the petals and the steering wheel, but its a damn good car that embodies all of the spirit you would expect from a Bimmer. I’m not saying I wouldn’t own a 135i, Id just save up and buy the Z4 if I had any say in the matter. If you want something nimble and small that you can drop the top in, the twin turbo Z4 is clearly the winner. With a 6 speed of course. And that killer Imola red interior. 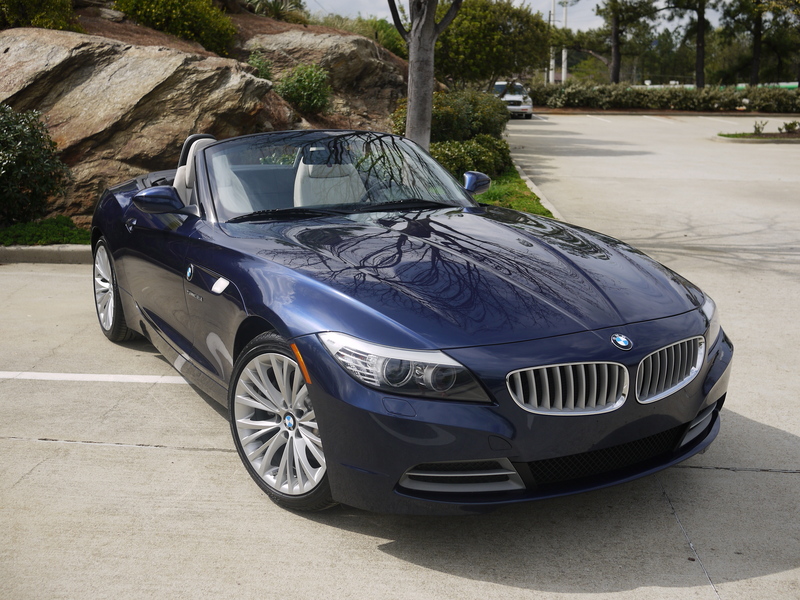 Click here to view our 2009 sDrive35 Blue Z4. 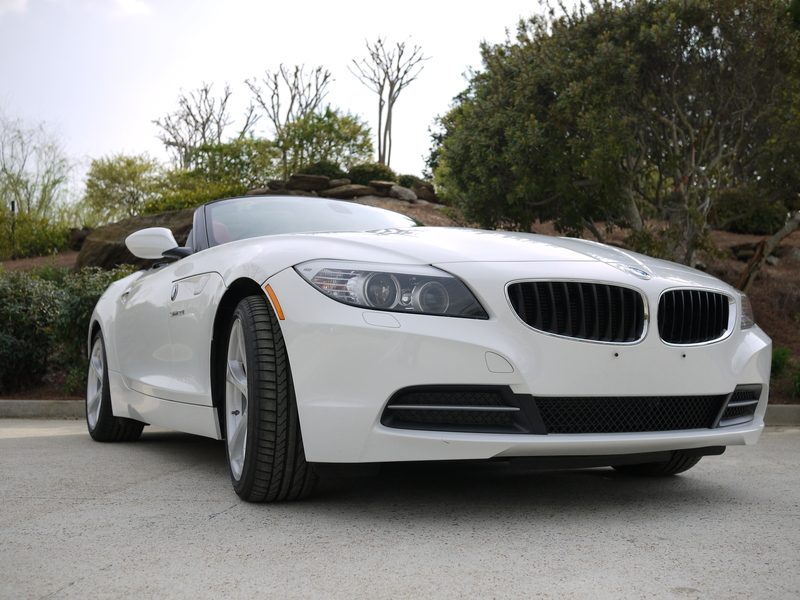 Click here to view our 2011 sDrive30 White over Red Z4.